On Sunday, September 18, the Buzzards met the Yankess for the NABA Championship for the 52+ division at Playfields Park in Davis. It was a close 1-1 game until a 7-run fifth inning by the Ol' Buzzards. Taylor Welz pitched a brillant 2-run, 10-hit, 3 walks and 6 strike-outs complete game. Four Buzzies had 3-hit days: Welz, Pete Von Zboray, Tom Keatley and Tom Luck. The final score of the 9-inning game was 11-2 Buzzards. That successfully concludes the 2016 season. More info is below with a quick re-cap of each game. Detailed descriptions of the games are under the game reports tab. Welcome to the Gold Country Buzzards web site. 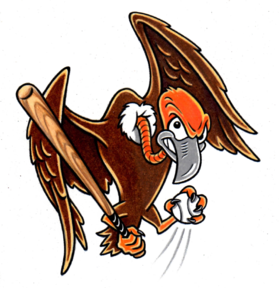 The Buzzards are a senior men's baseball team that plays in the Sacramento National Adult Baseball Association league. The Ol' Buzzards are in their 11th year as a team. The team plays its home games at James Field in Auburn and most of the team lives and plays in the Sierra foothills, which is historially the California Gold Country. The team has added some new and younger players to the mix this season. The Buzzards are excited about a couple of former Miners that are now old enough to play in the old man division and have joined the team. Tom Luck and Chris Shafer, both of Colfax, after some time off, have started playing Sunday baseball again. Their young legs will often be patrolling the outfield, pitching or at shortstop. The Ol' Buzzards are also welcoming back Ray Henry, Paul Lee, and Charles Jackson this season. The newest addition is Rich Potter, new to the Auburn area, and a pitcher and first baseman with experience on the mound and swinging the bat. The 2016 season is half over already. Due to Buzzards' dominance of the 52+ division for the last couple of years, the team was moved down to a younger age bracket for league balance. That means the Ol' Buzzards will be playing in the 42+ division and playing two-thirds of its games against opponents nearly 20 years younger. The age difference will be a disadvantage. At 42ish you are faster and stronger than the Buzzard team's average age of 59. The oldest Buzzard is 65 with eight players at 60 and over. The Gold Country Buzzards are up to the challenge and will have face tough competition during much of the season. The Buzzards will be moved back up to the 52+ division for the league playoffs in September. The 2016 regular season record was 10-8. A brief summary of the games so far this season follows: In the first game of the season on April 3rd, the Buzzards'were leading late in the game, but the Dodgers came-back to win 11-5 at James Field. After a rain-out on the 10th, the Buzzards clawed the Giants 16-2 in the afternoon at Playfields Park in Davis on April 17th. The third game of the season was played on April 24th at James Field. The Buzzies demolished the Astros 23-3. The May 1st game was against the 42+ Miners in the morning at James Field in Auburn. In nine tense innings, the Miners prevailed 5-4 with the assistance of a blind ump. The same ump showed up for the double-header on May 15th and was almost as bad. The Ol' Buzzards took on the younger Colt .45s for two at Franklin High in Elk Grove. The Colt .45s won the first one 6-2 on a six-hitter. The Buzzies bounced back with hot bats and 18 hits for a 18-12 victory in game two. On May 22nd the Buzzards clawed the Sacramento Sox 15-2. Back from the Memorial Day weekend, the Buzzards knocked around the Yankees 17-5 in a morning game at James Field. On June 12th the Buzzards clobbered the Miners 15-8 on the radio. The game was broadcast live by KAHI 950 AM and streamlined on-line for some nice publicity for senior men's baseball and the Gold Country Buzzards. The mighty 7-1 Dodgers were next on the menu for the Ol' Buzzards. On June 12th after 9 innings and 3 hours and 20 minutes later, the Buzzies defeated the first-place Dodgers 12-5. The last game in June, the 26th, was a close game at 7-6 for a while, but the Buzzards pulled away and beat the Giants 16-11. On July 10 the Colt .45s clipped the Buzzards wings 16-8 on a rough field at Casa Roble High School in Orangvale. After the All-Star break, the Buzzards fell to the first-place Dodgers 7-2 at Peterson Field in Rancho Cordova on July 24. The Sacramento Sox got stomped in Rocklin 16-1 in the afternoon on July 31. The stretch run of August games started with a 12-2 win against the Astros on August 7 with a rare morning game at James Field. The Yankees pulled off a major upset with a 17-15 victory over the Buzzards on a 104 degree afternoon game in Rocklin. In another tough loss, the Miners caught the Buzzards with two outs in the ninth. And won it in the 10th with the help of a two-run blast over the left-field fence. The last game of the regular season was August 28. The Buzzards jumped in front, but the younger Colt 45s prevailed 12-7. In the first-round of the 52+ playoffs on September 11, the second-seeded Buzzards put it to the third-seeded Giants 24-14. The Ol' Buzzards out-hit the Giants 29 to 13. The next game will be the NABA championship game on September 18. The site and time have yet to be announced. The fun 2015 season recap is below. The Gold Country Buzzards are champions of the world of Sacramento NABA baseball. The Ol' Buzzards beat up the Sacramento Solons on Sunday, September 20th, 18-1 in the NABA championship game at Playfields Park in Davis. In a re-match of last year's baseball championship game for men 52 years old and over, the Buzzards got off to a good start and put it to the Solons with hot sticks and a hotter defense in an easy victory and the Ol' Buzzards third straight Sacramento championship. On a beautiful morning in Davis, the first and second place teams of the ol' man division met at 10 o'clock for the baseball finale for the Sacramento region. Game MVP, Taylor Welz, out-dueled Tom Defazio and John Hagen of the Solons, through six innings with a shut-out. Meanwhile the Buzzards bats were pounding the three pitchers during most of the game for a 'cruising into victory port' affair. Rick Salmeri followed Taylor on the hill and then Gregg Novotny finished off the Solons in the ninth. A three-peat is rare and the Buzzards appreciate the team significance and wish David Kelley was here to enjoy the celebration of a team he founded. The Buzzards at one point in its 10-year history lost three championship games in a row, so the opposite feeling is wonderful and worth going for a four-peat in 2016. The Buzzards are still so sad to announce that our teammate, friend and long-time baseball guru, David Kelley, passed away on April 29th at 57 years old. David was the founder of the old Gold Country League and founder of the current, Gold Country Buzzards. David had been battling lung issues, but his recent diagnosis and treatment plan was so encouraging. Very recently, he looked and felt good enough to return to the field, maybe this season, but certainly by next. The teary-eyed Ol' Buzzards are having a hard time dealing with this one. Dedicating the season to DK is the least we will do. His international baseball accomplishments are too long to mention here. David was instrumental in getting the Buzzards into playing international baseball. He became part of the World Masters' Games and was spear-heading the upcoming baseball games in New Zealand in 2017. DK made us all envious as he traveled and played the game in so many cool places with his baseball excuse and passport. Some of the countries he has played in the last few years include Antigua, Cuba, Canada, Hungary, India, Italy and of course multiple times to Australia. A well done and casual Celebration of Life for David was held on Saturday, May 9th from 2-4 pm on James Field. His 40+ jerseys were displayed on the fence behind home plate. That dude played for a lot of teams in his travels and tournaments. David will be missed by many all over the globe. We will miss him dearly and chesish his memories until we meet again on the heavenly baseball field. Welcome to the 2015 Gold Country Ol' Buzzards baseball team's web site. This is the 10th year of what offically is Gold Country Hardball, or simply known as the Buzzards. On the baseball field the Buzzards are known as a tough ol' bird and we are usually on top when the game is over. The Ol' Buzzards are in the senior men's division (52+) of the Sacramento League in the National Adult Baseball Association. The team is managed by Dan Wukmir. The Buzzards have won the championship of the old man's division twice in a row, 2013 & 2014. And are poised to re-repeat with the 2015 squad. The proud Ol' Buzzards are one of the best teams at our age in the area, plus we regularly beat teams from the 42+ division. Last season, the Gold Country team beat the youngins' 4 out of 6 times. Losing only to the 2014 42+ finalists for the only losses of last season. Last season's record was 15-2-1. The 2015 team is another strong one. We lost some key players due to injury and retirement, but have added some new young studs to the Gold Country stables. Kevin Krantz and Mark Weathers are key pick-ups for the team from last year. Kevin once roamed center field for the younger Buzzard teams of 2010 - 2012. And is now old enough to play with the Ol' Buzzards. Kevin is a superb outfielder that was spotted wearing catching gear recently. His big bat and quickness on the base paths will be flashed often. Mark Weathers, a long-time nemesis with the Dragons and recently with the Reds, and a fabulous first baseman with a heavy bat, joined the team to the delight of the Gold Country. This strong team, however, because it is the defending champ, does wear a bull's-eye on its back every Sunday. We were a little dinged up going into the start of the season, stayed healthy most of the season until Krantz pulled a quad in August and sat out the end of the season to heal by championship game day on September 20th. The first game of the season was a re-match of the 2014 finals. The Sacramento Solons versus the Gold Country Buzzards, and this time was played at the Buzzards' home ballpark, James Field in Auburn. In a hit fest, 20 for the Solons and 16 for the Buzzies, the Solons prevailed 16-12. The team played well and displayed a nice offense, but it could not stop a hot and determined Solon team. Last season the teams met five times and the Buzzards swept the series. Repeating as champs will not be easy, but will be fun to try. So far, with a 17-3 record the Ol' Buzzards are primed and ready for the championship game. A brief recap of each game of the 2015 season follows. For a more detailed and interesting report on the game(s), hit the game report button. Game #1: Buzzards lost to Solons in a 16-12 slugfest with 36 combined hits in the game. Game #2: Buzzards pound Yankees 29-6 with Von Zboray (6) and Wukmir (5) knocking in lots of ribbies. Game #3: Buzzards knouck-out Astros 16-6. Welz led the hit parade (18) with 3 hits and Wilson knocked in 4 runs. Game #4: Ol' Buzzards defeat young Dodgers 9-4. In the first game of 4-game series against the younger (42+) division opponents, the Buzzards look good and the hurlers threw great games. Salmeri for 2 innings (7) and Welz pitched 2(2) struck out 9 Dodgers. Game #5: Buzzards beat Miners 12-8 in Gold Country contest. The 52+ Buzzards knock-off the Gold Country 42+ Miners in Auburn. Salmeri and Novotny hold down the swingin Miners from the mound. Game #6: Buzzards drop a close one to the 42+ Rays 11-10 at Playfields Park in Davis. The Buzzards were robbed several key times on the field and at the plate by blind, and I mean blind umpires. The teams honored David Kelley before the game with words and Haydon Tucker playing Amazing Grace on the bagppipes in a tear-jerker. Game #7: Buzzards lose another close one 13-12 to the undefeated Colt .45s. The Buzzards out-hit the .45s 20 to 19 in a see-saw game. Game #8: In a revenge game, the Buzzards beat the Sacramento Solons 13-3. The Solons won the first match of the seaon 16-12. Game #9: Over the airwaves of KAHI and the internet on kahi.com, the Buzzies beat-up the Miners 12-2. Game #10: Yanks gave the Gold Country 8 a close game at 13-6 at the only game scheduled at C-Bar-C Park this season. Game #11: With a 2-0 lead after two innings, the Buzzards scored 15 runs in the next two innings to cruise to a 20-0 easy win over the Astros. Game #12: Ol' Buzzards beat the young Dodgers 10-4 in a tougher game than the score indicates. Game #13: A gutty come-back including two runs in the last at-bats to stun the 42+ Rays 6-5. Game #14: Buzzards fall behind early to the Solons, but came-back with a vengence and win 11-5. Game #15: Buzzard's avenge earlier loss to the top 42+ team, Colt .45s. On the road in Davis, the Buzzards scored in every inning to compensate for Welz getting ejected from the game in the 3rd inning. Game #16: Buzzards beat-up the Yankees with 25 hits in the 16-3 victory. Game #17: Buzzards fall behind by 3 runs early with a close game until the sixth then 8 runs in the seventh to put the game away 16-6. O'Donoghue got the win and Salmeri threw the last four. Garcia was 4-for-4 with 3 RBI's. Game #18: The score after the first inning was 4-1 Buzzards and stayed that way until the Buzzies broke-out with 7 runs in the sixth. Two more added in the seventh made for a 13-1 ball game. Game #19: The Yankees gave the Buzzards a scare and a close game with the Ol' Buzzards prevailing 15-13. Tucker's first game back this season from shoulder surgery he went 3-for-4 with two runs scored and two RBI's. Salmeri got the win and Novotny the save. Game #20 Buzzards stomped the Astros 23-4 in the regular season finale. Rick Salmeri played every defensive position during the game. The Buzzards won the championship game on September 20th in a morning beat-down of the Sacramento Solons in Davis. The Buzzards dominated the match in all aspects of the game with an 18-1 win and a three-peat of the NABA championship. The Gold Country Buzzards put an exclamation point on the 2014 season by repeating as champs of the old men's division. The Ol' Buzzards soundly beat the Sacramento Solons 13-1 in the finals of the 52+ division of Sacramento NABA on Sunday, September 21st, at Playfields Park in Davis. The Buzzies rode the back of Taylor Welz as he threw a 9-inning, 3-hit gem against a hot hitting team. Solid defense and 9 strike-outs prevented the Solons from mounting an offense. The Buzzards scored 7 runs in the last two frames to account for the wide winning margin. Taylor also got 3 hits, scored two runs and knocked in a run to help his own cause. Other hitting studs were: Kelly Garcia with 3 hits, and Dave Everingham, Jim Milligan, Tom Keatley and Pete Von Zboray with two hits each. Excellent pitching, solid defense and good hitting was the recipe for victory in the championship game, but was also a microcosm of the great season. More details of the game are included in the Game Reports file. This concludes the Buzzards season with a record of 16-2-1. It was a terrific season with a great group of guys that play a good brand of hardball. By the way, the two finalists in the 42+ division championship game following our game was a match-up of the only two teams to beat the Buzzards this season - Dodgers and A's. Previous Buzzards information is below. The Buzzards defeated the Astros 14 - 2 on Sunday, September 7th at our home field in Auburn, James Field at Recreation Park. Rick Salmeri started and got the win. Taylor Welz threw 3 shut-out innings to uphold the revenge game win. The Astros tied the Buzzards 10-10 in their last meeting on August 10th. The regular season ended on Sunday with a record of 15-2-1. The 1st place Buzzards had a bye in the first round of the NABA playoffs. The next game is September 21st against the winner of the semi-final game. The league championship game will be against the Sacramento Solons at Playfields Park in Davis. The game is at 9:30 am. Wish us luck. The Gold Country Buzzards are the defending champs and the favorites to repeat, but the team knows how hard it actually is ... to repeat as champs. The Buzzards have been a team since 2007 and have been in the playoffs since 2008. The team has been in the finals 5 times. Won in 2008 (beat Free Agents), lost 2009 (Reds), lost 2010 (Reds), lost 2011 (Valley Cats) and won again in 2013 by finally beating the Reds. The championship opponent will be either the Solons or the Astros. However, the Buzzards will not be at their healthiest nor their strongest. The 15-man roster will be 10 non-injured players for the game. Toughness will allow 3 players, who have missed recent games due to injuries and are still nicked-up to join us for the game. Barry Forman has missed half the season with a cut-off finger-tip at the start of the season and a knee injury on June 8th at C-Bar-C Park will return by the final game. Kelly Garcia, out with a broken big toe, will also return for the big game on Sept. 21st. The team will be missing 2 key healthy players due to business and family vacations, so it will be an interesting cahmpionship game. On KAHI Radio on June 29th the Ol' Buzzards played the Miners and beat the younger disivion Gold Country team 5-2. The annual Radio Game was braodcast live on KAHI 950AM, The Voice of the Foothills, from 2 to 5 pm. This Gold Country battle royale took place at James Fioeld in Auburn, even though the Buzzards were the visiting team on our normal home field. The game was close at 1-0 thru 6 innings before the Buzzies broke through for two runs in the 7th and two in the 8th, and then held on to win 5-2. The Buzzards are still off to a fabulous start with a 13-2-1 record. And comfortably in first place in the over 52 division for the Sacramento NABA. So, welcome to the Gold Country Ol' Buzzards' website. The Buzzards are ol' guys, over 52, that still play hardball. Nine innings of sliders, curves and, kind of fast, fastballs while playing with steel cleats and using wood bats with pine tar, dirt and spit, and where stealing is allowed, is a blast for these old kids. The team is from the Gold Country region of nothern California and we play our home games in Auburn. In the Sierra foothills, east of Sacramento, a good brand of men's baseball is still proudly played. The Buzzards are members of the Sacramento National Adult Baseball Association. The Gold Country Buzzards are the 2013 champs of the old man's division. The Gold Country Buzzards have been a baseball team since 2006. It was formed by the senior players of the old Gold Country Baseball League. Several of the original members still play on the team, but we have added a bunch of good ball players since that continue to make the Buzzards a strong squad and a fun team to play on. This season we are playing in the 52+ year old division. All of the home games will be played at James Field in Auburn, while the practices were held at Colfax High before the season began. This year's team is mostly returning players with a couple of new guys sprinkled in to cover for the loss of key players from last year's championship squad. The two new studs are excellent ball players and great additions to the team. Mike Wilson is the only Buzzard rookie and lives in the lower Sierra foothill town of Granite Bay. Mike will be roaming the outfields and as a lefty, playing some first base. Jim Milligan is rejoining the Buzzards after playing for many years with the younger Ol' Buzzards. Jim is a fabulous catcher and plays the infield besides carrying a big offensive stick. Milli is from Oroville and was with the Buzzards' team that went to Australia in 2009. That team won the prestigious Gold Medal for senior baseball in the World's Masters' Games held in Sydney. Fred 'Freddie' O'Donoghue re-joined the Buzzards after a multi-year baseball absence, full-time in late June. Freddie plays everywhere and is a solid pitcher. The addition of these guys makes the team scary good. Check out the game details by clicking on the Game Reports. This awesome team's stats are a clcik away. Most Buzzards took off the Memorial Day weekend, but Gregg 'Surf Dawg' Novotny and Dan 'Wookie' Wukmir went to San Diego and played in the over 60 tournment with the Taos Tortugas. The team was made up of primarily Sacramento Solons and players from Taos, New Mexico. The team got hot at the right time and won its division championship. This is last year's welcome page with a run down of the 2013 season. It has a happy ending. The Gold Country Buzzards are Champions of the World of Sacramento NABA 'old man' baseball. The Ol' Buzzards beat the Reds in the finals in Davis 9 - 3 on Sunday afternoon in the 55+ year's old division. The Buzzards scored 5 runs in the second inning to take the lead and countered the Reds' 3-run 5th frame with runs in the next 3 innings to keep a nice run-cushion during the game. Dave Everigham pitched a complete game for the Buzzards and shut-down the good hitting Reds to just the 3 runs on 8 hits with no walks and 7 strike-outs. Hitting studsm Keatley and Gregg Novotny with 3 hits in the game and Taylor Welz knocked in 3 clutch runs. The Buzzards had faced the Reds twice before in the NABA finals (45+ division) and lost the championship 3-game series to the Reds in 2009 and 2010. The Buzzards lost to the Valley Cats in the 3-game finals in 2011. The getting older Buzzards have not won the NABA title game since 2008 when beating the Free Agents in the championship series. The 55+ division determines its champs with a single game and the teams were pretty evenly matched, so there was not a favored team. The Reds had won the season series 2-1, but the Buzzards had won the most recent game in late July and were on a nice roll. The Reds ended their season by losing two of the last three games and let the Buzzards pass them on the final day of the regular season to grab first place and the Division Champs T-shirts. The Ol' Buzzards won the first game of the playoffs against the Sacramento Solons 14-6 on Sunday, Sept 8th. In an afternoon home game at James Field in Auburn, the Ol' Buzzards put away the Solons by the 5th inning and coasted to the 14-6 win. Taylor Welz pitched a 9-inning gem with seven strike-outs to advance the team to the finals. Charles Jackson lead the 18 hits, hitting brigade, going 4 for 5 with 2 doubles, 3 runs scored and 2 knocked-in. Dave Everingham was 3 for 5 with 2 doubles and 3 runs scored and 2 RBIs. The 5th spot in the order was 5 for 5 with Pete Von Zboray hitting 3 for 3 with a double and 2 runs scored with 2 ribbies. Gregg Novotny went 2 for 2 replacing Pete. In the last regular season game of the year, the Buzzards held-off the Sacramento Solons to win 16-10. The Ol' Buzzies took the lead for good in the seventh inning, after being tied at 9-9. 23 hits helped power the Buzzards over the Solons with 18 hits. Hot bats included Taylor Welz 3 for 4, Charles Jackson 3 for 3 with two doubles, Tom Keatley 4 for 4, and Rick Salmeri 3 for 3. On Sunday, August 11th, the Ol' Buzzards' game was on the airwaves via KAHI 950AM. The game was broadcast live at 2 o'clock by KAHI 'Voice of the Foothills' in Auburn with play-by-play announcer Dave Rosenthal. The game was against the Gold Country Miners (12-4). This annual radio game was streamed live on the internet via kahi.com and is available to be downloaded on their home page. Our game followed the station's broadcast of the Oakland A's game. The 45+ Miners beat the 55+ Buzzards earlier this season 10-0. But on our home turf with lots of family watching and listening on the radio, we put it to the younger Miners 9-4. The scored was tied 4-4 after six innings. A great job of pitching by Mike McCabe held the high powered Miners down to four runs. McCabe also got two hits and two RBIs in the game. With a 13-5 record, the Buzzards are in first place in the 55+ division of Sacramento NABA baseball and will enter the playoffs as the number one seed. The playoff schedule for the Ol' Buzzards is a first round game against the fourth place Solons. The playoff games begin after the Labor Day weekend, The first-round will be played at home on September 8th at 2 pm at James Field in Auburn. The championship game will be played the following Sunday at 2 pm at Playfields Park in Davis. See the game report for highlights and details. This year's team moved up in age brackets and is playing in the 55+ years old division of the Sacramento League in the National Adult Baseball Association. This older team is managed by Dan Wukmir and assisted by Coach Gregg Novotny. The team consists of senior Buzzards from last year's team and former Buzzards, plus a few other good ball players from the Gold Country to form a new team. Last year's younger Buzzards will become the Pirates and play in the 40+ division. Several Ol' Buzzards have come out of retirement to play again this season. Gregg Novotny, Tom Keatley, Barry Forman, Norm Tucker, Dave Kelley, and Steve Cook. The active Buzzards that stayed with the team and moved up to the older division are Ray Henry, Mike McCabe, Pete Von Zboray, Taylor Welz, and Dan Wukmir. Add a few new additions like Kelly Garcia, Paul Lee, Rick Salmeri, Dean Perkins in May and Jim Kuchar in June and the team looks pretty strong. And now Dave Everingham and Charles Jackson will add some excellent defense and big bat. The roster has required some adjustment and now has 17 solid players. This has been a fun season, so far. The 2013 Ol' Buzzards are a great group of guys that play pretty good baseball. Here's a brief summary of the season so far. Opening Day was Sunday, April 7th. The first game of the season was played at James Field in Auburn at 2 o'clock against the Reds. In a tight and exciting game, the damn Reds won 2-1. Their pitcher threw a 5-hit complete game gem to take the opening day contest. 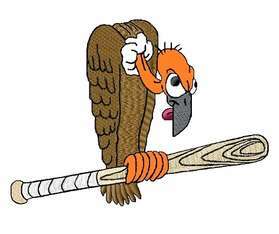 On April 14th, after scoring only one run in the previous game, the Buzzards exploded for 28 runs in pounding the Astros 28-14 at C-Bar-C Park in Citrus Heights. On April 21st the Buzzards demolished the Yankees 29-5 at James Field in Auburn. The following Sunday, April 28th, the Buzzards shut out the Solons 12-0 at Playfields Park. Rick Salmeri (5 innings) and Taylor Welz (2 innings) shut down the Sacramento Solons in the morning game in Davis. On May 5th the Buzzards beat the first-place 45+ Dodgers 7-4 in an exciting come-from-behind victory at home at James Field in the afternoon. After the Mother's Day break on May 19th, the Buzzards lost 10-0 to the new first place team in the 45+ division, the Gold Country Miners. The Miners got the hops and played a top notch game at Antelope High. After the Memorial Day break, the Buzzards fell to the Reds at Antelope High 9-2 in a hot afternoon game on June 2nd. On June 9th, the Buzzards grounded the Astros 12-2 with Taylor Welz and Gregg Novotny on the mound in Galt in a 10 am game. The following Sunday, Fathers' Day June 16th, the Buzzards beat the Yankees 12-2 in a morning game in Davis with Gregg Novotny and Rick Salmeri dealing it from the hill with no walks. On June 23rd, the Buzzards were down 10-2 in the third inning, yet won going away 17-10 against the Solons. McCabe won in relief as the Buzzards scored 15 unanswered runs and held the Sacramento Solons to no runs after the third inning. The Buzzards continued to win with a 14-6 victory over the 45+ Red Sox at James Field on June 30th in a hot game with temps over 100 degrees. After the July 4th break, the Buzzards faced the top team in the 45+ division, the Dodgers (9-2) at C-Bar-C Park in Citrus Heights in a 10 am game. After being tied 7-7 after seven, the Dodgers pulled away and won 17-9. On July 21st, the first-place 55+ Reds came to James Field in Auburn for a 2 pm game with temps near 100 degrees. Down 6-3 in the 5th inning, the Buzzards came-back with a run in the 6th, 4 runs in the 7th and one more in the 9th to win 9-6. At home on July 28th the Buzzards lost a shocker to the Astros 12-8. The playoff bound Astros surprised the Buzzards with a big early lead and good defense to win. In Citrus Heights on August 4th at C-Bar-C Park, Welz pitched a two-hitter in shutting out the Yankees 15-0. The annual Radio Game was on August 11th at James Field. Broadcast live on 950 AM and on streaming on the internet via kahi.com, the Buzzards beat the 45+ Miners 9-4. On August 18th the Buzzards beat-up the 45+ Red Sox 12-4 in the last home game of the season at James Field. The last regular season game was played on August 25th in Galt. The Buzzards clawed the Solons for a 16-10 victory and first place in the 55+ division. 2012 Season was a success. The Buzzards did lose in the playoffs to the eventually league champ. The 2012 Ol' Buzzards season came to an end in the first round of the playoffs. The team lost a heart-breaker on Sunday, August 26th to last year's champs, the Valley Cats 12-11. In an exciting game played in Elk Grove at the new Bartholomew Sportspark, the Valley Cats scored a run with two outs in the bottom of the ninth inning to win a see-saw game. This one slipped away late, so it hurt. The Buzzards end the 2012 season with a 13-7-1 record and lots of good times and fond memories of another enjoyable season. A big thank you to the Buzzard fans for your continued support of a bunch of kids in old man bodies playing the National Pastime. The Buzzards rested the orange vest-jerseys until next season - no Phoenix trip this year, but Melbourne & Geelong, Australia in the 2013 Australian Master's Games sounds like fun in October. We've been invited to join an Aussie team, many of the guys from the 2009 World Master's Games championship. For details of last season's games, click on the Game Reports button. The Gold Country Buzzards are now a 55+ men's baseball team located in the Sierra Foothills - Gold Country. We play with steel cleats and wood bats in 9-innings of hardball in the Sacramento National Adult Baseball Association. This is our 8th year as a baseball club. A short version of the 2012 season follows, the long versions (game reports) are available by clicking on Game Reports to the left. The 2012 Buzzard baseball season finally began after 3 rainouts on April 22nd. Opening Day was in Folsom at Lembi Field against the always tough Dragons. The rusty Buzzards did not play well or hit worth a damn and lost 11-1. The next week on April 29th, the Ol' Buzzards played a double-header against the younger (most under 50) Mudville Nine at James Field in Auburn. In both games the Buzzards came from behind in their last at-bats to win, 6-5 and 5-3. On May 6th the Gold Country Buzzards won a forfeited game by the Free Agents in the morning game and played the Gold Country Miners in the afternoon game at Colfax High. The Miners are a single A division team that we play once this year. The Buzzards won 14-9. With no games on Mother's Day, the Buzzards were off to a good start at 4-1. The next games were on May 20th. The Buzzards played a split double-header. The first game was at 10 am against last year's champs, Valley Cats, in Elk Grove at Bartholomew Sports Park. The second game was at 2:30 in Galt (20 minutes south) at the Community Park versus the Astros. The Valley Cats prevailed 4-1 in the first game. And the tired Buzzards tied the Astros 5-5 in the afternoon game. As the game ended the ring-of-fire solar eclipse started. The Buzzards were off for the Memorial Day weekend. On June 3rd, the Free Agents flaked-out again for a forfeit win. The Folsom Dragons came to Auburn on June 10th in a battle of the top two teams in the division. The Dragons got the bounces and the calls this time and prevailed 13-7. On Father's Day, June 17th, the Ol' Buzzards played an old team, the 55+ Yankees at Brooktree Park in Citrus Heights in a morning game on a 100+ temp day. The AA Division Buzzards pounded the single A squad Yankees 25-0. The team record was 6-3-1 and in third place at the half way point. The second half started with a key double-header on June 24th against the Valley Cats at Colfax High. The Buzzards won the first game 5-1, but lost the afternoon game 8-1. After the July 4th break, the Buzzards beat the Rancho Cordova Dodgers 4-1 and 15-4 on uly 8th at Colfax High. The next Sunday, July 15th, the Buzzards lost to a fired-up and youonger Mudville Nine team at Lembi Field in Folsom 11-4. The game was a 5 pm game on a hot day on a dusty beat-up field. In a must win for the Mudville Nine, the Buzzards had one bad inning to break-up a close game. The Buzzards then stomped on the Free Agents on July 22nd 18-4 at Playfields Park in Davis with Scott Reeves pitching a six-hitter. Radio station KAHI 950AM broadcast the July 29th game against the Fair Oaks Giants. The 2 o'clock game followed KAHI's broadcast of the Oakland A's game in Baltimore. The Buzzards enjoyed the notoreity of a radio audience and listening to the game on the radio in the dugout while the game was going on. The Buzzards won 8-2. On August 5th, the Buzzards beat the Rancho Cordova Dodgers 8-6 at El Camino High in Sacramento. Bob Wooden homered for the team's first one this season. The next Sunday, Aug 12th, the first place Dragons won 10-2 in a miserably hot 105 degree afternoon game. The last regular season game was played at James Field against the Bulldogs. Led by the hittin' machine of Mike Baker (4 for 4), the Buzzards beat up the Bulldogs 14-3 to end the season with a 13-6-1 record. And a third place finish in the division. The Buzzards were a strong team again this year with the goal of returning to the NABA Sacramento championship series for a 5th consecutive year. For the record, the Buzzards beat the Free Agents in 2008, lost to the Reds in 2009 & 2010, and lost last season to the Valley Cats. So, we have enough incentive to push this good ol' team into the playoffs and beyond again this year. The Gold Country Buzzards have been a baseball club since the 2006 season starting with a 4-16 record. The team improved to a 8-10-2 record in 2007. In 2008 the team dominated the league with a 23-1 record and claimed its first championship. The team record in 2009 was 20-6, in 2010 it was 19-5, and in 2011 it was 17-7 making the playoffs each year. Our home fields continue to be James Field (home field of Placer High) in Auburn and the Colfax High Varsity Field. This year's squad may be even stronger than last year's finalist. Joining the Buzzards this season are 4 terrific ball players that bring skill and fun attitudes to the team. They are speedster and outfielder, Kevin Krantz from Carmichael; multi-versatile and can play every position, Terry Kelley from Auburn; varsity coach for Colfax High and tough pitcher + good hitter, Mike McCabe of Weimar; strong infielder and stronger hitter, Troy Nogosek from Roseville, father of the famous son, Steve, of Woodcreek High athletics. And the returning nasty lefty pitcher, Dave Kephart from Auburn after a sabbatical last season. If this team can get healthy and then stay injury free, we will be hard to beat in the playoffs. The Buzzard family is still in shock and crying over the sudden death on September 21st, 2011 of Dennis Viegas at the age of 53. Dennis was a Buzzard all-star on the field and in the batter's box and a tremendous teammate in the dugout and off the field with his always nearby loving wife, Shari. Dennis collapsed playing center field during the third pitch of the game for his week-night baseball team, the Royals of the Men's Senior Baseball League. The Royals were playing the Auburn Braves which includes many Buzzards at James Field in Auburn that night. His memorial service was on a specially hard rainy Monday, October 10th, at 1 pm at McAuliffe Fields in Sacramento. Despite the heavy rain, hundreds of friends showed up to pay their respects. Dennis managed the baseball complex for a living. The Gold Country Buzzards will retire number 4 and will now wear a black patch with the number 4 on our jerseys. The Buzzards 2011 season has come to a close. The Gold Country guys lost both games of the championship series to end the season on Sunday, September 11. The Valley Cats, losing only two games this season, prevailed over the Buzzards in tough battles at McAuliffe Field in Sacramento, 7-2 and 13-10 in 10 innings. In the first game of the playoffs, the Ol' Buzzards played the Free Agents on August 28th at Peterson Field in Rancho Cordova. In a nail-biter, the Buzzards prevailed 13-11. That means the Buzzards will play the Valley Cats in two weeks for the NABA Sacramento championship. The best-of-three series starts with a double-header on September 11th. All championship series games will be played at the McAuliffe Fields in Sacramento. Our first game will be at 10 am and the second game at 2 pm. This is the fourth straight year the Gold Country Buzzards have played for the regional title. We beat the Free Agents in two games in 2008 and lost to the Reds in three games in 2009 and 2010. Next on the Buzzard menu is Valley Cat. The previous Sunday, August 21st, the Ol' Buzzards played the first place Valley Cats at McAuliffe Field in Sacramento for the last regular season game. In a see-saw battle, the whinny Cats scored two runs in the bottom of the ninth to win 8-7. The Buzzards were playing short-handed due to a Father-Son Tourney the same weekend. Several Buzzards were on the MSBL Braves team that won the tournament after losing their first game on Saturday. Congrats to the dads, Mike Baker, Gary Stonebrook, Taylor Welz and Bob Wooden. Our 2011 season record is 13-6-1. Previous to beating the Free Agents in the first-round playoff game last Sunday, we have lost all three games this season to the Free Agents in the ninth inning. Gold Country Ol' Buzzards Baseball Club information is below. We are a 45 and-over men's baseball team based in the Sierra Foothills - Gold Country - of Northern California. Our home fields are in Colfax and Auburn. We play 9-inning games with wood bats, steel cleats and hardballs in the Sacramento National Adult Baseball Association (NABA). This is the sixth year of the Gold Country Buzzards Baseball Club. The goal is to play a high caliber of baseball with men our age, have fun on Sundays and compete for the regional NABA title. The Buzzards were the champs in 2008 and have played in the championship series the last two years, losing to the Reds, so our expectations are high. Thankfully, the team for 2011 looks good. The Buzzards lost several key players from last season due to retirement or injury, but our reputation as a good team with a good bunch of guys, helped fill the gaps with some new terrific, ol' baseball talent. The Buzzards added excellent ball players with pitchers Jim Steiger, lefty, and Mark Fowler, righty, from Sacramento, and big hitter Tony Brashear from Grass Valley. The team enjoyed the return of Jim Milligan behind the plate, as he missed most of last season with a back injury, until he seriously hurt his foot in the May 22 game. Jim will return, but it may be a while. The Buzzards needed to add a replacement catcher and solid player with a new schedule of lots of double-headers due to five rain-outs. We were fortunate to add one of the best and experienced ball players in Sacramento (for his age) to the team for the June 12 game and remainder of the season, Dennis Viegas. The Buzzards will be sending a team to Phoenix, Arizona this year to compete in the Men's Senior Baseball League's World Series. That, end of year national championship, tournament will be played from Oct 31 thru Nov 4. The teams success has been recognized locally in the Auburn newspaper and on radio station KAHI 950 AM. The Buzzards are also featured every season on a live radio broadcast of a game on KAHI following their broadcast of an Oakland A's game. This season's game will be played on July 24th at 2 pm at James Field in Auburn against the Gold Country Miners. The 2011 season started on April 3 after two rained out games in March. The Buzzards opened the season at home this year by hosting the Dragons at James Field in Auburn. In a close game the Ol' Buzzards came from behind to win 5-4 in the bottom of the ninth inning. The next Sunday, April 10, the tough Free Agents came from behind at their home field in Antelope to beat the Buzzards 6-5 in the bottom of the ninth. On April 17, the Buzzards tied the Valley Cats at home 5-5 after nine innings. This league is very competive, so it will be an exciting 2011 season. After the Easter break, the Buzzards played a double-header on May 1 against the new men's over 45 Gold Country team, the Miners, at Colfax High. The Miners were off to a good start at 2-1 in the new season, but then ran into the veteran Ol' Buzzards who swept the two game set. In the first game, the Buzzards came from behind in the last inning with five runs to take the lead 7-5 and then held on for Jim Steiger's first Buzzard win. In the second game, the Buzzards pounded out 15 hits for a 12-4 victory with Mark Fowler pitching his first Buzzard win also. Lots of timely hitting and good plays for a nice sweep. With five games under our belt and a 3-1-1 record, the Buzzards took off the next weekend for Mother's Day, May 8th. The Giants game on May 15 was rained-out. This was our third rain-out of the early season. The following week, May 22, the Buzzards played a home game at Colfax High against last year's champs, the Reds. Jim Steiger and Mark Fowler pitched a heck of a game and the Gold Country gang shut out the Reds 6-0. There were no games over the Memorial Day weekend. The double-header on June 5th against the Free Agents at Colfax High was washed out for the 5th rain-out game this season. On June 12th the Ol' Buzzards played a new young team (mostly in mid or younger 40's), Giants, at Mahany Park in Roseville. The Buzzards were tested by these young wipper-snappers with the score 5-4 in the 8th inning. Clutch hits in the ninth inning produced a final score of 8-4 Buzzards. The Fathers' Day, June 19th, game against the tough Free Agents was at James Field in Auburn. The nine inning, 3-hour and 20 minute game produced a final score of Free Agents 19 - Buzzards 13. Both teams won and lost the game in the late innings. This one hurt, 'cause now we have two loses, both to this team. The next week on June 26th, the Buzzards lost to the Reds 9-6 giving up one bad inning of eight runs to run the season record at the all-star break at 5-3-1. On July 10, the Ol' Buzzards took on the first place Dragons and swept the double-header 7-5 and 13-3. Wooden pitched nine tough innings for the win in the first game with clutch two-out hits by Dan Wukmir and Scott Reeves for big late runs. In the second game, Mark Fowler pitched a gem and Taylor Welz went 4 for 4 with a key double and drove in three runs in leading the team to 16 hits and a demolition of the Dragon pitching in the afternnon game. The following Sunday morning, July 17, the Buzzards traveled to Elk Grove to play the Valley Cats at their home field. The whinny Cats play on the Greg Vaughn Field at Bradshaw Christian High School. The Buzzards left their hittin' sticks in the Foothills and lost 11-1 to the first place team. On July 24, the Buzzards played a split double-header in Auburn and won both games. The first game was against the young Mudville Nine. The Ol' Buzzards put it to these young wipper-snappers 12-2. The second game was broadcast live on local radio station KAHI AM 950. The 'Voice of the Foothills' had play-by-play man, Dave Rosenthal, doing this Gold Country contest from the stands behind home plate along with fellow Buzzard and game analyst and radio personality, 'Tony B' Brashear. A good turn-out saw the Buzzards score four runs in the eighth inning to put away a close game 9-3. A terrific Gold Country BBQ was held after the game with the Buzzards hosting the smoked meats feast. The Buzzards won on July 31 via forfeit with the Reds. Next week August 7th, the Buzzards play the Rancho Cordova Dodogers (9-4)in Auburn. Last season was a blast. The following is information about the 2010 season. The 2010 season ended with the Buzzards playing in the NABA 3-game championship series, losing the series 2 games to 1. Last season's information is below. The Gold Country Ol' Buzzards baseball season ended on Sunday, September 19th, when the team lost the final championship game to the Reds 11-3. The best of a 3-game series to decide the Sacramento champs for 2010 went to the third game after an exciting double-header the previous Sunday. The overall season record was 16-9 including 2 wins and 2 losses in the plaoyoffs. It was a fun and exciting season and to even be playing baseball in our 50's, is a real good thing. The brief story of the season and other info is below. The full game stories are available under Game Reports. The Buzzards had advanced to the final game of the Sacramento NABA Championship Series (best of 3 game series). On Sunday, Sept 12th, the Reds and Buzzards battled to exciting finishes in each game to split the double-header. Both teams stole a victory with amazing comebacks in their last at-bat for walk-off wins. In the first game at Petersen Field in Rancho Cordova, the Buzzards were ahead 5-2 with 4 defensive outs remaining. Usually a pretty good position to be in, however, the Reds then knocked in 4 runs. After 1 out, they got 5 hits plus a walk in the bottom of the 8th inning to take the lead 6-5. The Gold Country boys bounced back with 2 runs in the top of the 9th to re-take the lead 7-6. But, those damn Reds got 4 key hits to score 2 runs to win with a walk-off single. After that tough loss and with the hot sun beating down on the field and in the dugout, it would have been easy to go thru the motions in that 2nd game. Also, the starting pitcher for the 2nd game, Bob Wooden, was injured in a spectacular diving catch in the 1st game and came out of the game with an injured back. Speaking of spectacular catches, one of the best bare-handed catches of all times occured in the 8th inning. The Reds had scored 4 runs and had runners at third and second with two outs. The next batter hit a sizzling line drive to left field. Barry Forman was charging hard for the sinking liner and went into a slide to catch the ball. The ball hooked to his right so he reached out with his right hand and bare hand caught the ball less than 12 inches from the ground. An absolutely amazing catch. He had to put ice on his hand between innings for the rest of the day to keep the swelling down, but it was worth it. Wow! The second game got off to a bad start and the Reds held a 6-0 lead going into the bottom of the 8th inning. The tough Ol' Buzzards then scored 3 runs on 5 hits and a walk to make the game closer at 6-3. The Reds then scored 2 more runs to increase their lead to 5 runs with the score 8-3. No worries mate, has been the theme all year and it was tested that day. The Gold Country Buzzards then proceeded to tear apart the Reds in the last of the 9th with 9 consecutive batters getting on base. The game winning hit by Mike Baker with the bases loaded over the left fielder's head came with no outs. Wow. Wow! On Sept 19th in the final game of the Sacramento NABA Championship Series, the pitching of the Reds held down the Buzzards' bats as the Reds won 11-3. The game started at 11 am under threatening clouds for rain, then the afternoon turned into a bright blue sky day for baseball at Playfields Park in Davis. The ball didn't bounce our way during the game and the strike zone was questionable and not in our favor. The loss in the final game was tough, but it was great for the team to play for the championship. The 2010 season was exciting and fun with a great bunch of guys. Back in 2009, the Buzzards completed the 2009 regular season with a 22-4 record with two of those losses in the championship series against the Reds. So, this 2010 championship series was deja vue as the Buzzards faced the Reds in the final game last season at this same field. We won the regional NABA title in 2008 (23-1). We were featured in the newspaper and mentioned several times in the Auburn Journal. We also had a game broadcast live on local radio station KAHI 950 AM the last few seasons. The Buzzards' record for the 2010 regular season was 14-7. The Buzzards qualified for the playoffs as the #4 seeded team. The first round of playoffs are single elimination games, so the stakes are especially high on a single game. The Ol' Buzards beat the #1 seeded Valley Cats at Mather Field on August 29 in a tight contest, 4-3 in nine innings. Here is a replay of the season that began with opening day on March 21 against the always tough Free Agents. Facing one of the better pitchers in the league, the Buzzards were shutout 5-0 at Lembi Field in Folsom. Our home opener on March 28 was spoiled when the Dragons came back in the ninth inning with three runs to win 6-4. We only lost 5 games in the last two years, so this was not a typical start to the season. With several key starters also playing hurt this season, the team struggled early to score runs and pressed on defense, so there was lots of room for improvement as the season progressed. We hit our stride after the July 4th holiday and went from 6-6 to finish the season at 14-7. Batting averages are down from last season. But the motto 'Just hit the dang ball' has been working. This has been an interesting season. The 21-game regular season ended on August 22. The third game of the season was scheduled after the Easter break, on April 11, against the Valley Cats in Elk Grove, that game was postponed due to rain. On Sunday, April 18, the Buzzards played their third game of the new season and beat the Astros 6-1 in Colfax for the first win of the season. Dave Kephart struck out 9 and Mike Hayworth added 2 more in a dominant pitching performance. The Ol' Buzzards faced the Sultans on April 25 at Antelope High and won an exciting come-from-behind game 11-8 by scoring 8 runs in the last 4 innings. Mike Hayworth, Ray Henry and Bob Wooden pitched the 9-inning game. The season's first double-header was next on May 2 at Colfax High. The Buzzards played against our fellow Gold Country brethern, the Coyotes, with a BBQ afterwards. Before the game, both teams lined up along the sidelines and paid tribute with silence and prayer to Dave Langness, the Coyote who died on the Antelope High baseball field on April 25th from a massive coronary. In a touching moment of the pre-game memorial taped to send to Dave's family in Missouri prior to his funeral, Norm Turner's son, Hayden, played Amazing Grace on the Bagpipes while standing on the pitcher's mound. After the tears cleared, the Buzzards jumped on top early in the first game and then rode Dave Kephart's strong pitching performance to a 9-3 victory. In the second game, the Buzzards scored 4 runs again in the first inning to take an early lead in support of Bob Wooden's win 10-5. Mike Hayworth pitched the closing two innings of each game. Both Gold Country teams plus family and friends went to the Colfax Ballpark picnic area afterwards for burgers, organic sausages, potato salad, chips, and cold drinks. Pete Von Zboray and family brought the grill and stuff in the truck and got everything going including working the grill. Thanks to Pete & family and Ray Henry for putting the BBQ together. The Spring weather was great for baseball, the Buzzards won both games, no one got hurt and the BBQ turned out well. A wonderful afternoon and a great day to be a Buzzard. The team was off for Mothers' Day and returned to action on May 16 at home against the Free Agents, who beat us 5-0 on opening day. In a tight game from begining to end, the Buzzards scored the winning run with two outs in the ninth inning on a Mark Wronski fly ball to right field to win 7-6. Dave Kephart pitched another strong game. Revenge is always so sweet on the field. On Sunday, May 23, the Buzzards travelled to Elk Grove to play the first place Valley Cats in a double header. On a nice field but with a stiff wind all day at Bradshaw Christian High, the Buzzards went down twice 5-1 and 10-8 on a very frustrating day. There were no games during the Memorial Day Weekend. The next games on June 6 were a battle royale double-header against the Reds at their home field. The defending champs, with just one loss this season, brought 18 players to the game to take on the Ol' Buzzards. The Buzzards travelled down to the flat lands, this time to Inderkum High, the new high school near ARCO Arena, for the 10 am start time. With a background of the North Natomas Little League's end-of-season celebration with their bounce houses, dunk machines, air slides, and music, both teams split the twin bill. The Buzzards won the first game 5-4 in extra innings after the Reds scored two to tie the game in their last at-bat. The Reds prevailed in the second game 11-6 against a 10-man Buzzard team on the hottest day of the year, so far, at 94 degrees. On Sunday, June 13, we played the Dragons at Lembi Field in Folsom at 10 am. With the Dragons leading 6-2 entering the ninth inning, the umpire got dizzy from the heat and the game stopped. The game resumed on July 25 at Antelope High when we played the Dragons again. They won. On Father's Day the Buzzards beat the Astros 19-10 at Antelope High. The next game on June 27, the Buzzards shut out the Sultans 12-0. Dave Kephart pitched a no-hitter with two walks at Colfax High. The league was off for the Independence Day weekend. The Buzzards faced the Free Agents on a hot, 100°, July 11 at Antelope High in a 10 am game. Thankfully we had the morning game, but the Free Agents pounded out 15 hits to beat the Buzzards 9-2. On July 18 the Buzzards with 19 hits defeated the first place Valley Cats in dramatic fashion by scoring four runs in the last inning. A two-run homerun by Charles Jackson put the Buzzards within one. Then later in the inning with bases loaded and two outs, Barry Forman knocked in the winning runs with a line drive single to center for an exciting victory. The next game was at Antelope High against the Dragons on July 25 at 10 am. Before the regular game, the Dragons and Buzzards resumed their previous game that ended prematurely when the lone umpire could not continue due to the heat and his health. The game stopped at 6-2 Dragons with the Buzzards batting in the top of the 9th inning. The Buzzards did not score in the resumed 9th inning, so the Dragons win that one. In the regular game, the Buzzards fell behind 5-0 early, but came back to win 12-8. The next game was on August 1st and was broadcast live on KAHI 950 AM, the gold country region radio station located in Auburn. The game was at James Field in Auburn at 3 o'clock against the Coyotes. The game followed KAHI's broadcast of the Oakland A's game against the White Soxes in Chicago. The Buzzards looked good and sounded good on the radio in beating the Coyotes 10-1. On August 8th the Buzzards took on the Sultans at Rusch Park in Citrus Heights in an afternoon game and dominated the game 14-0. Kephart and Wooden pitching the shutout. The team pounded out 18 hits for the third time in four games, as the Buzzards are hitting on all cylinders with excellent pitching, tough defense and hot big sticks. A terrific Team Party was held on Saturday, August 14th, at Donnie and Emily Colbert's home. Nice place, 100 acres with a Sierra view and a new pool. The barbeque worked out well on a gorgeous afternoon in the foothills. The Astros and Buzzards played a practice game on Sunday, August 15th, because they showed up with only seven ball players. The Astros forfeit was followed by a Reds forfeit the next week because the Reds wanted to rest their players for the upcoming playoffs. The season ended with a whimper, but the Buzzards looked good in beating the Valley Cats on Sunday in the playoff game. The first round playoff game on August 29th was a do-or-die situation against the team with the best record this season. The winner plays in the NABA championship series after Labor Day and the loser goes home 'til next Spring. Dave Kephart pitched a gem against a good hitting team holding the Valley Cats to 3 runs on 8 hits. The Buzzards scored 4 runs on 9 hits and made all the plays with its tight defense to win an exciting game. So exciting that the V-Cats had the bases loaded in the bottom of the ninth with one out and down by a run. Keppie struck out the side to clinch the victory. Wow! KAHI Radio broadcasts Buzzard game summaries several times during their local radio shows especially early in the week and on Dave Rosenthal's Afternoon Show from 4-7 pm. Listen in on 950 AM or stream it on kahi.com.